2017 is almost here… 2 days left for 2016. I do not have any idea what this year will bring. I just wish & hope the best for all of us. I love this festive time… I usually wake up early as I have to do a lot of things. Work, shopping & cook and today I will make the Greek New Year cake: Vassilopita. Greek New Year cake: Vassilopita or “Sweet Bread of St” Basil is a New Year’s Day cake. It contains a hidden coin. It is associated with Saint Basil’s day, January 1. It is made of a variety of doughs. The observance begins with the arrival New Year. 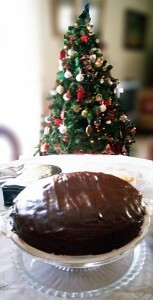 The householder cuts the Vassilopita with the arrival of the New Year. Firstly the householder signs a cross with a knife across the cake. The first slices of Vassilopita are cut for symbolic people, devoted to the Lord, St. Basil, poors, depending on local and family tradition. The householder continues cutting a piece of cake for each member of the family and the visitors present at the time, by order of age from eldest to youngest. 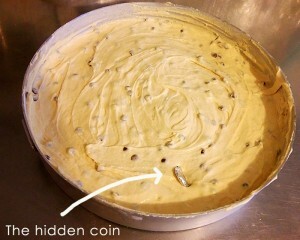 The individual who receives the portion of the Cake which contains the hidden coin is considered Blessed for the New Year. Nonetheless, in popular tradition, Vassilopita is associated with a legend of Saint Basil. According to one story, St. Basil called on the citizens of Caesar to raise a ransom payment to stop the siege of the city. Each member of the city gave whatever they had in gold and jewellery. When the ransom was raised, the enemy was so embarrassed by the act of collective giving that he called off the siege without collecting payment. St. Basil was then tasked with returning the unpaid ransom, but had no way to know which items belonged to which family. So he baked all of the jewellery into loaves of bread and distributed the loaves to the city, and by a miracle each citizen received their exact share, the legend goes. As I mention before, the Vassilopita is made of a variety of doughs. 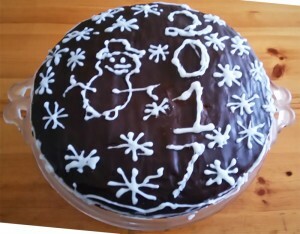 Mine will be cake, I usually make a simple cake and decorate it for the arrival New Year. Cake has the necessary sweet flavoring which symbolize the sweetness and joy. It also symbolizes the hope that the New Year will be filled with the sweetness and happiness. This year I decided to change a bit this recipe… Making…. Start by dividing the eggs into yolks and whites. Place the egg whites in the bowl of the electric mixer, along with a pinch of salt. Make sure your egg whites, bowl and whisk attachments are clean and free of any water. Whisk the egg whites until the mixture is very thick and glossy and a long trailing peak forms when the whisk is lifted (meringues). Place the mixture in a bowl and set aside. Use the electric mixer, to mix the butter and icing sugar. Add slowly (one to one) the yolks and continuing the beating for 5 minutes. Then add the vanilla and yogurt, continuing the beating. Reduce the mixer speed and add successively in the bucket, the meringue and flour, beating for 1 ‘- 2′ minutes, until the mixture become homogeneous . Βutter slightly a baking sheet N ° 26 (diam. 26 cm.). Pour into the mixture, add the coin (without marking the place Do not cheat …) and shake the pan rotary to clearly pave the mix. (If the coin has not come through, we help to hide). Bake the cake in a preheated oven in air at the middle shelf, at 180 ° C for 60 to 65 until they swell and detach from the walls. Once it cooked, remove the from the pan, turning it round in a Christmas plate. Let cool on a rack for 15 to 20 minutes and then place the cake (better upside down) on a platter. Melt the chocolate in microwave with the sour cream. When the mixture is is smooth and and glossy, pour it over the cake. Leave it aside for some hours. Prepare the glaze, in a bowl add all the ingredients and blend with a spatula to combine, until the glaze is smooth and and glossy. Add a little bit more hot water, if needed (the glaze should be like a thin cream). I took a syringe to make my drawing with the glaze, carve the number of the year on top of the glaze. Thank you. 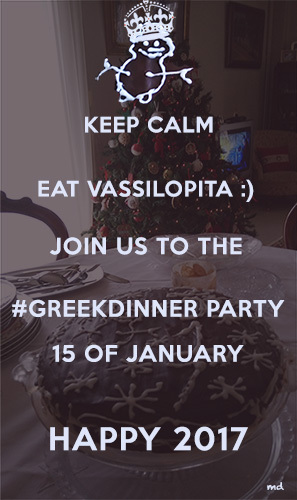 4th #GreekDinner party around the World on January 15th, 2017. A great opportunity to celebrate the best of Greek culture, heritage, cuisine, arts, and business.